After a terrible experience at a certain well-known spa chain, I was on the lookout for a new spa place for my beauty needs. 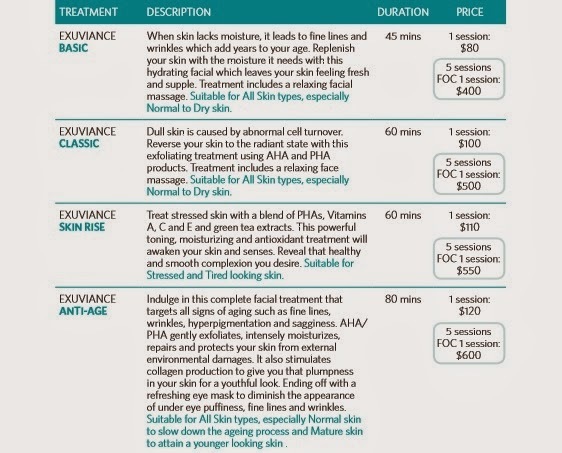 I was privileged to be invited to Exuviance Club, a for one of their signature beauty treatments. I had actually passed by their outlet one day when I visited their mother company, the NeoStrata office. Researching abit on social media, I was impressed by the number of raves on instagram under hashtag #exuviance. Exuviance Club has been around since 2013, so its still relatively a word-of-mouth beauty secret. While I was looking forward to their speciality whitening treatments, a closer diagnosis by my beautician concluded that its clarifying treatment would be better suited since I has some visible acne scars and blemishes, and so we went with that. The treatment room itself looked welcoming, was clean and neat, with soft ambient light. I must say that this is the first time that I have felt completely at ease with the whole treatment procedure. My beautician Daphne was soft-spoken, but proved to be very professional and knowledgeable about the products. I also appreciated her putting me at ease by informing me of its use and prior any application. First, the routine cleansing stage with a gentle cleansing cream, which surprised me as they did so twice because as explained; our surrounding environment is currently filled with grime, oxidants and bacteria. After wiping off, she applied toning lotion to sooth the open pores and basically prep the skin for the rest of the treatment. Next, the face was wiped using a clarifying booster pad, very refreshing and cooling to the skin. Its another layer of cleansing as well as treating those pesky problem areas. Daphne first outlines the areas around my nose, lips and eyes areas with some Vaseline. This is to act as a protective barrier from the peel, so as not to damage these extra-sensitive areas. I usually get cold palms and panic modes when it comes to the extraction stage in the facial but guess what: There's absolutely NONE! Instead, an AHA 20% peel paste is brush-applied on the face and let to sit for a few moments. In my opinion, I felt no pain at all, save for a slight tingly-itchy feeling on small areas on my cheeks. This step is where the dead skin is being eliminated, so that new young skin can effectively absorb the nutrients. AHA refers to Alpha Hydroxy Acid, is an acid extract from fruits which is found to help rejuvenate older damaged skin through enhanced cell renewal. Impressive to know, Exuviance's two founding researchers, Dr Eugene Van Scott and Ruey Yu own the original patent for the use of glycolic acid (Alpha Hydroxy Acid) in reducing wrinkles. Here, Daphne is spraying a neutralizer for the AHA peel before gently wiping off with facial tissues. I was then given the Exuviance Purifying masque to treat my skin blemish problems, and naturally dozed off as it set for the next 15 minutes. Once removed, my face was then moisturised using their Evening Restorative Complex, which helps to treat the impurities and blemishes that are visible and invisible (below the skin layer). After the mask was removed, the facial ended with moisturizing with their inhouse Evening Restorative Complex solution, as well as a thin layer of Multi-protective day cream to give some sun protection before I headed out to my next event. I thought this was very thoughtful as not all spas do that for you, most seem to end at the moisturizing stage. Here's some before and after pics. I think the change is nothing short of amazing. Do note that no editing was done for either pictures, and pardon the difference in lighting. Off the bat, what's immediately noticeable is that the red pigmentations and patches on near my nose and centre of face have diminished. 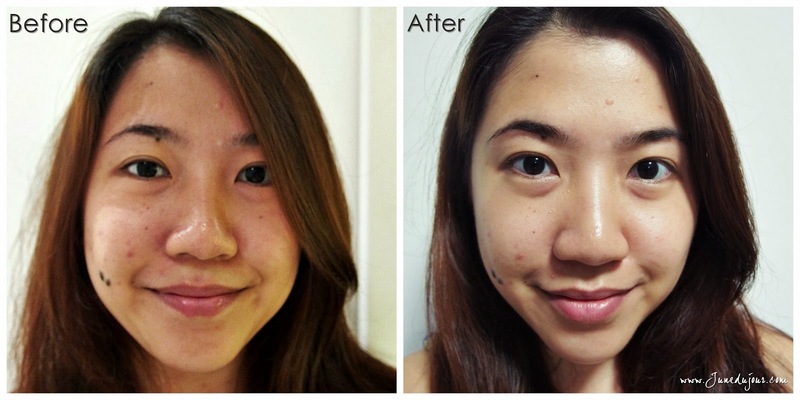 The peel has also seemingly smoothed my otherwise bumpy complexion and my pores (especially on nose) minimised! And although there's a difference in lighting, I love how my 'after' face is radiant with my skin catching the luminance softly, compared to the 'before' where its dull on all areas except for nose (which was oily). I simply could not stop touching my face after the treatment because it felt so smooth. Did I mention that because of this, make-up application is better? I no longer have small dry flaky patches where my foundation cakes up, and I use lesser amounts since I have lesser blemishes to conceal (Do note that blemishes and acne scars won't disappear instantaneously, but you will notice lightening. Repeat sessions would be recommended for this). Thank you for the invite, Exuviance Club! Exuviance is located at 6 Tagore Drive , #01-06 Tagore Building, Singapore 787623. Open from Monday to Friday, 9:00 AM to 6:30 PM. **Please note that all views expressed are made by me honestly, based on personal trial and evaluation. what a great possibility you had to receive such an incredible treatment. Your skin looks fresher, clearer and brighter afterwards. You explained your treatment thoroughly and covered the important aspects well. I've not heard of this brand although I have heard of chemical peels. Thank you for sharing your experience. wow your skin is dramatically glowing right after the facial! Way to go! You look amazing after the treatment ! I shall give this a try too...Thanks for sharing.. This treatment is amazing! Seems exactly like what I need ..... how I wish it was in Austria! Oh your skin looks visibly smoother and more radiant! The place looks serene and professional too! Glad you had such a good experience! its true, regular facials does help make up go on better, and skin just feels so much better! 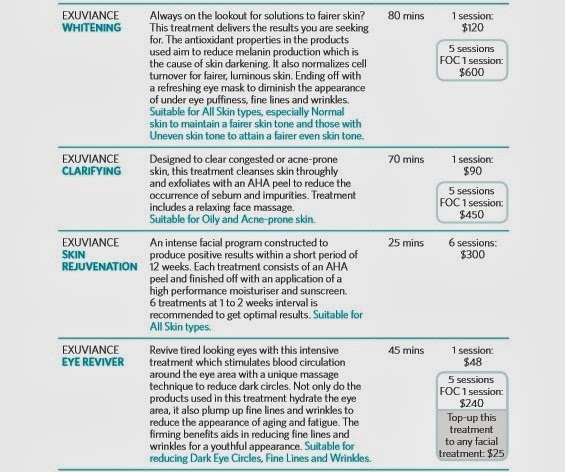 look amazing after the facial.....seem like a great product to try!!! nice post. the treatment seems good. would love to try it sometimes. Sounds like such a pampering session!